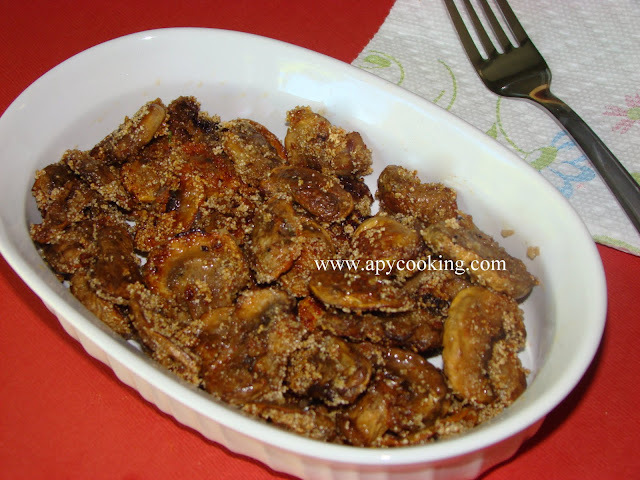 During my last India trip, my aunt (in-law) made some tasty shallow-fried mushroom by coating them with rava (sooji). I loved the crispy outside and tender insides. Today I was very tempted to make them when I saw a box of mushrooms in my fridge. So I sliced them, threw in some spices, coated them with rava and shallow-fried them. See, it's that simple! Juice of lemon (optional, about 2 tsp). Once you wash the mushrooms make sure you drain out all the water. You can wash in advance and place on a towel or a large strainer to remove all the water. Chop mushrooms into slices (about 1/4th inch thick). You can also just cut them into halves. 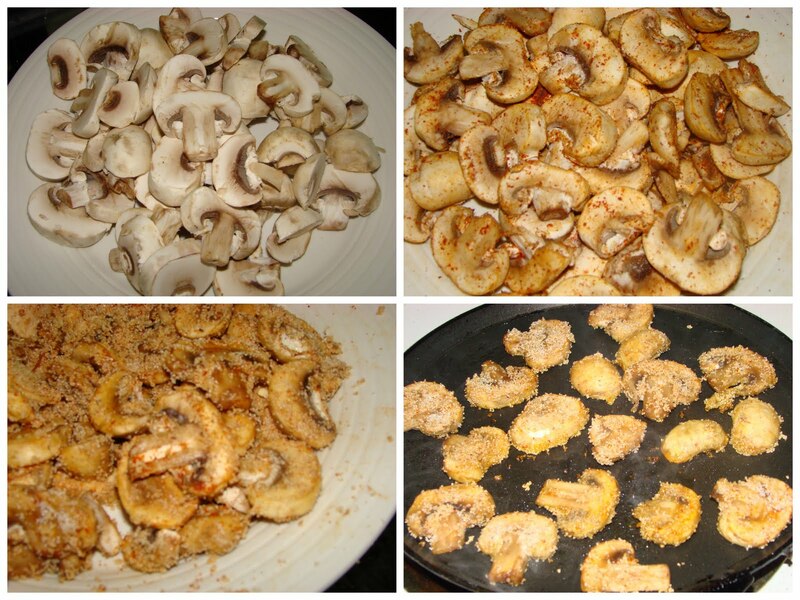 Place mushrooms slices on a large plate or bowl and sprinkle spicy powders of your choice. Don't add salt. Mix well, coating all the mushrooms with the powders. Keep aside for 15 mts. 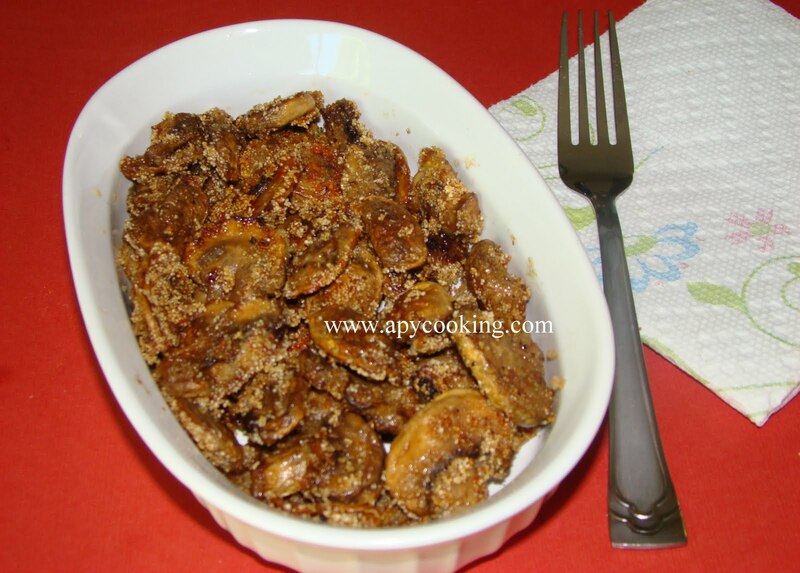 Roll the mushroom slices in rava. [There will be some rava leftover, you needn't use up the entire lot]. Now sprinkle salt to taste and mix. Heat 2 to 3 tsp oil or ghee in a shallow-bottomed pan and spread it with a spatula. Place mushroom slices and roast (uncovered) for a few minutes on each side till they turn golden brown. Squeeze juice of lemon if you like a lemony taste. Enjoy the ooze of the juicy insides when you bite into these yummy mushrooms! Not a chance there'll be anything left by the time I return, is there? wow, looks so yummy and delicious. tried this .. was yum yum..relished n liked by all at home.. even my 3 yr old! made this quite a few times but forgot to tell u abt it..